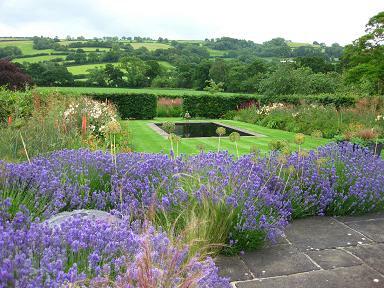 The Yeo Valley Organic Garden is a constantly evolving, varied 6.5 acre garden with a contemporary feel. 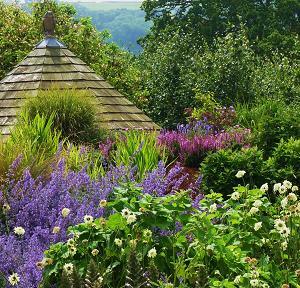 You must visit the Yeo Valley Organic Garden. The centrepiece of the most recent re-development is a purple glasshouse set within a formal design, framed by hedging and leached Malus "Red Sentinel". The more informal areas of the garden include coloured theme borders, a birch grove and perennial wildflower meadow. In spring the woodland is carpeted with snowdrops, wood anemone and bluebells whilst in high summer the gravel garden is filled with colour, shape and movement achieved by repeat-planting on a generous scale. Autumnal fireworks are provided by late perennials, dahlias and grasses. 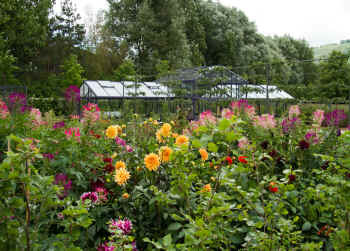 Growing" along-side traditional produce in the kitchen garden, are giant wrought iron flowers and vegetables. There are many other quirky sculptures to be found around the garden. 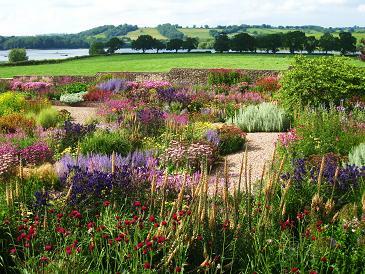 Grasses are used extensively to link the garden to the Mendips to the south of the house, while a simple sweep of lawn gives fine views over Blagdon Lake to the north. We are the one of only a handful of organic ornamental gardens as certified by the Soil Association so lots of great ideas to take away, including what we do about slugs!